PLEASE NOTE that this is an intermediate level technique…not for beginners! I suggest that beginners start out with the Warp Substitution tutorial here which will allow you weave motifs on a solid color background without having to deal with the extra manipulations required for double weave. 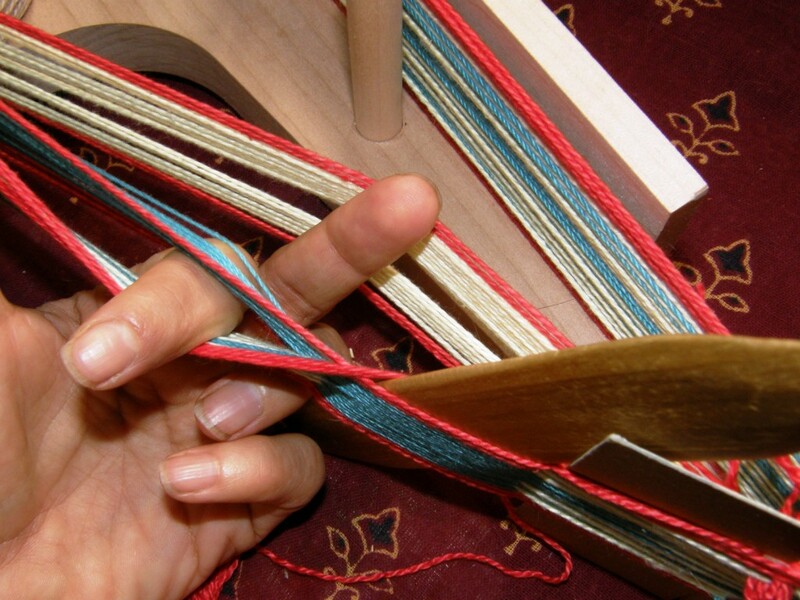 There are additional instructions for the inkle loom at the end of this tutorial. 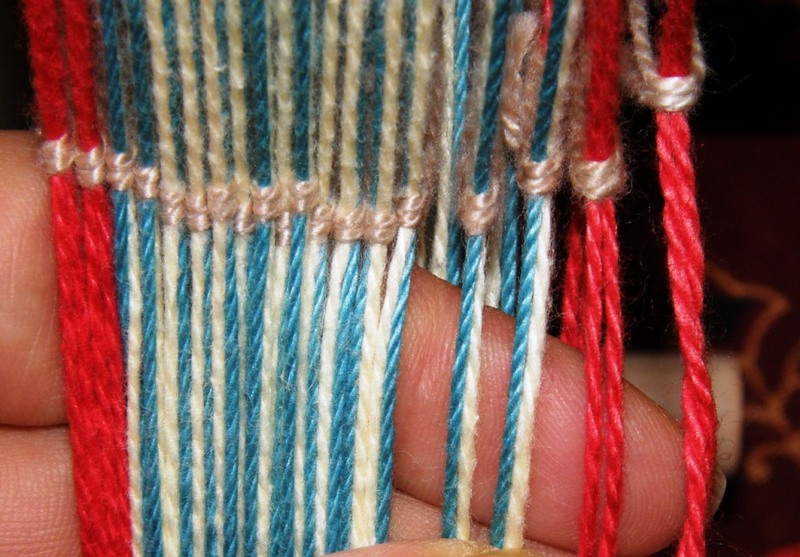 The band at left is an example of one woven in one-weft double weave technique. 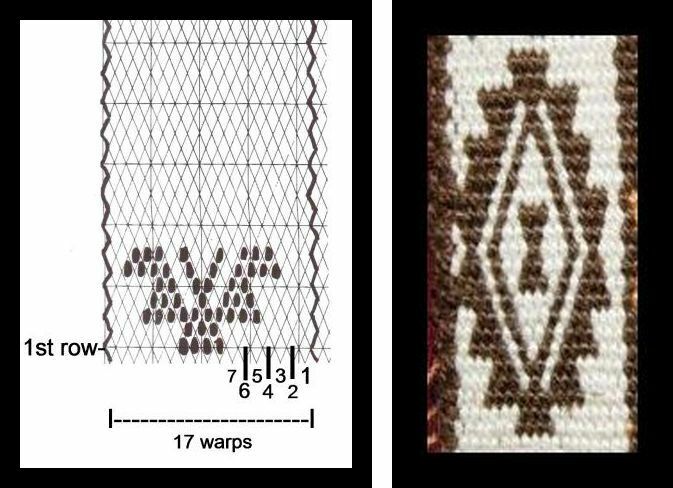 This technique will allow you to weave motifs on a solid plain-weave background without having long floats on the reverse. 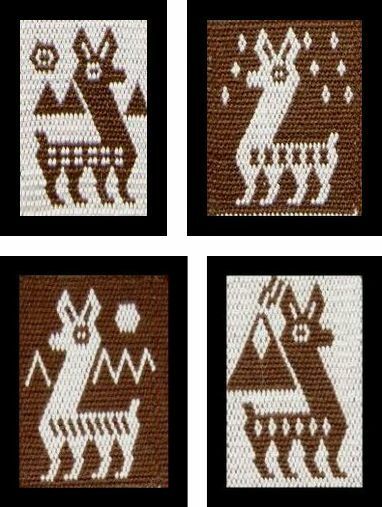 The motifs on the back side of the weaving look exactly the same except that they have their colors reversed. 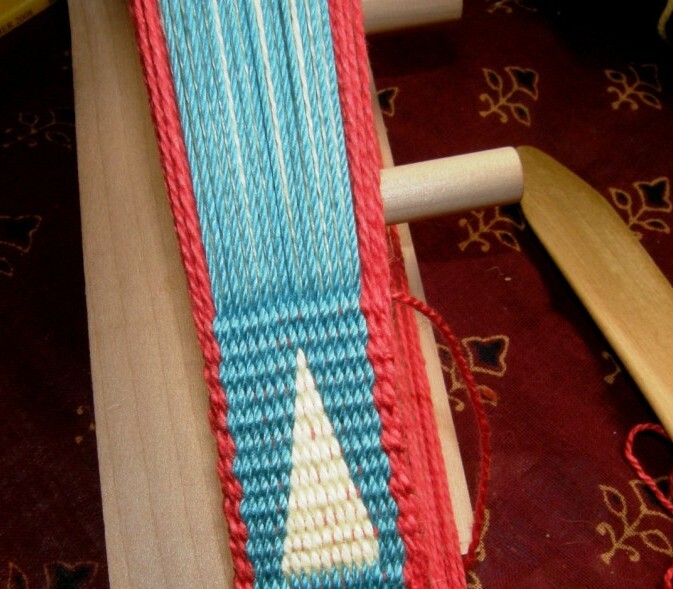 The band is warp-faced and has two layers-hence the name “double” weave. One weft weaves both the upper and lower layers and a thick sturdy band is produced. Here, in Bolivia, it is quite often used to make belts. My example above is the strap for a Bolivian charango. 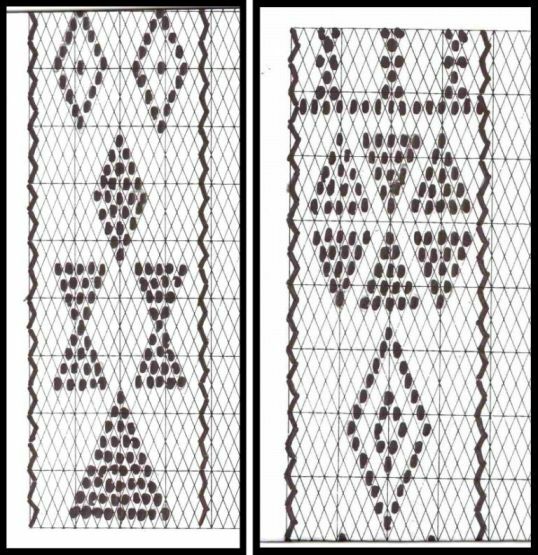 Patterns for this weave are charted on ”diamond” paper, each diamond representing one warp. Charted above at left are the first rows of the ”star” pattern on the woven band pictured above on the right. Count the diamonds on the chart. The first 7 have been counted for you. There are 17 diamonds and, therefore, 17 warps in this design. The first row has four brown warps, represented by the four black spots, forming the pattern on a background of white warps. This is the kind of chart we will be using for this weave but our pattern will be simpler. You will see that the star is made up basically of triangles. We will be weaving triangles, diamonds and diagonals gradually building up our designs on a sample band. PATTERN CHART FOR A ONE-WEFT DOUBLE WEAVE SAMPLER. THERE ARE 15 WARPS IN THIS PATTERN CHART. This is my suggestion for a sampler band in this new technique. This will help you learn to make basic shapes while practicing the double weave technique. You can make and print out your own ”diamond” charts using this site. You will be weaving triangles and a variety of diamonds, gradually putting shapes together to make a sextagon. You can also weave horizontals and verticals. After finishing the sample shapes, draw some of your own designs on a chart and continue experimenting. You can easily weave letters with this technique. WARPING FOR ONE-WEFT DOUBLE WEAVE. Here is a short video showing how I set up to warp a double weave keyfob (pictured below) with brown borders and a red and gold design. I wind 3 revolutions for the brown borders for this particular piece and 16 for the red and gold pattern area. THE TUTORIAL PROJECT – a sample band. I suggest using 3 colors for this project – one color for the border and two colors for the pattern area. In the pattern area, one color will be for the background and one for the motif. Make sure that there is a good contrast between the two colors you choose for the pattern area. The weft is usually the same color as the borders. Divide your border color into TWO balls as you need to wind two strands together. I recommend winding two revolutions for the border of your sample band. Cut the border color at the start warp stake and tie on the two pattern colors. These will be wound together for 15 complete revolutions for the pattern chart we are working on in this tutorial. 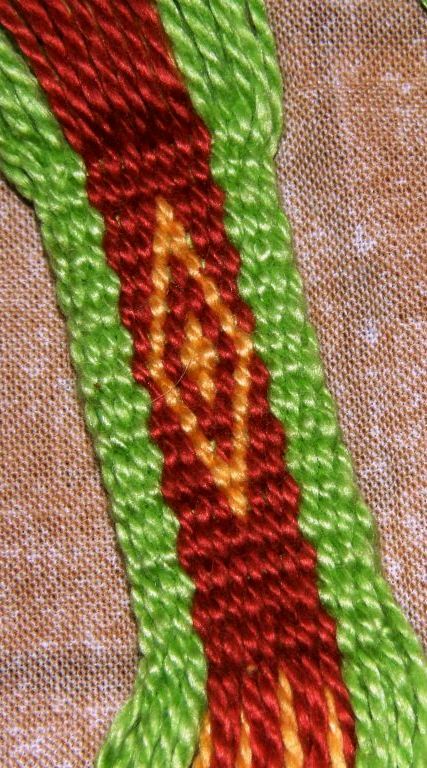 STEP 3- Cut the pattern colors at the start stake and tie on both strands of the border color. Wind two complete revolutions of the border color. Since writing this tutorial, I have done some experiments trying to improve the appearance of the borders in one-weft double weave and have found that if I start and end my warp with a single strand of my border color, the edges of my bands are neater. Wind one revolution with a single strand of the border color and then continue winding doubled strands as per the above instructions. Finish with one revolution with a single strand. This helps bridge the gap between the upper and lower layers of the double weave and stops the outer edge warp from kind of “rolling off” the side of the band as you pass the weft from upper to lower layer. It is this tendency to “roll off” that sometimes makes the edges of the double weave bands look a little untidy. I love the way this little trick so improves the edges of my double weave bands! I have chosen my three colors for my sample band…beige for the borders, with red and white for the pattern area. I will be able to weave white motifs on a red background and then change to red motifs on white, if I want, as my weaving progresses. This is what your warp will look like once it is off the warping board. I am using very thick (12wpi) cotton yarn for this band as it photographs well. At left you can see what your warp will look like once it is off the warping board. My cross sticks are in place and taped together for security. 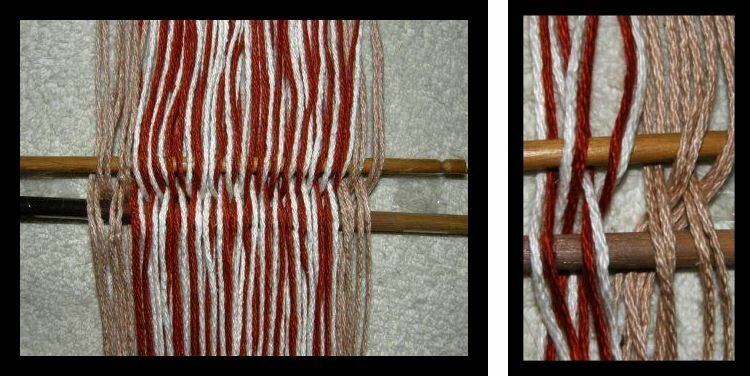 In the picture on the right you can clearly see the arrangement of the warps in pairs across each stick. The warp is just lying on the floor and is not under tension so the strands are crossed and not looking so tidy! 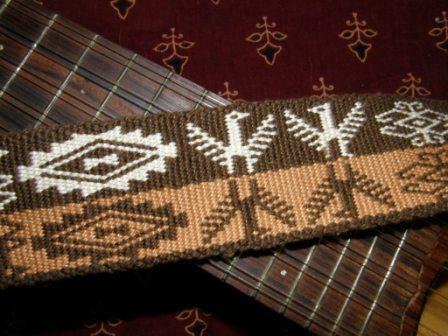 All the warps passing over the lower cross stick will be enclosed in your continuous string heddles. 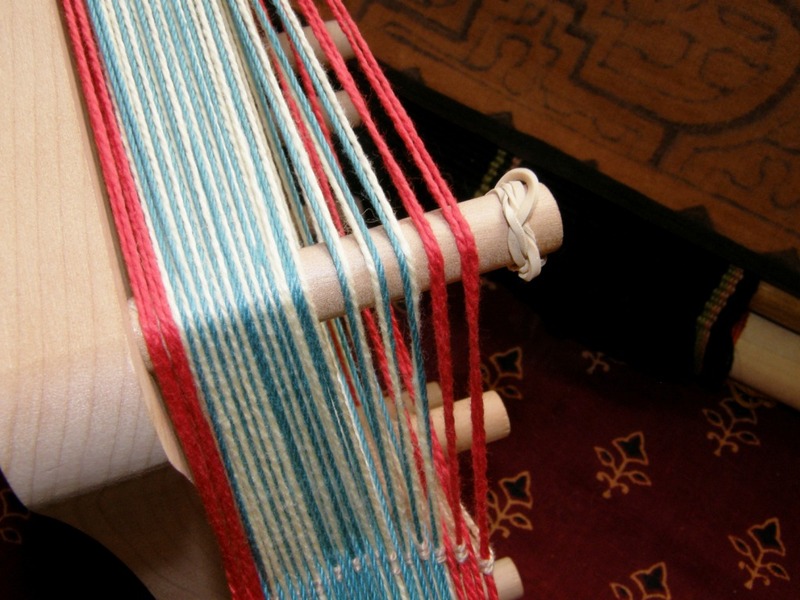 Each heddle will enclose a PAIR of warps – one red and one white in the pattern area and two beiges on the border. All the warps passing over the upper cross stick will be enclosed in a shed loop or, if you prefer, controlled with a shed stick. Just replace the upper cross stick with a thicker stick. Don’t forget to tie a piece of string or yarn from one end of the stick to the other so that if it falls out of the shed you won’t lose the shed!! 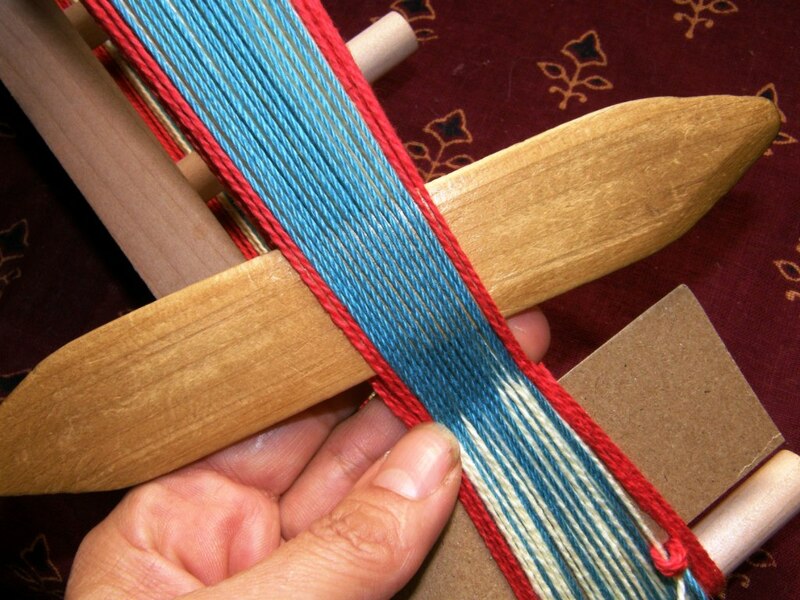 Here is a short video if you need extra clarification of which warps need to go into heddles. In this video clip I am working with a warp that has a three-revolution border of brown threads with sixteen revolutions of red and gold for the pattern. All the warps which are passing over the orange stick will go into helddles. The blue stick will then be replaced with a thicker dowel which will serve as the shed stick. ABOVE LEFT: Install your heddles and shed loop or shed stick. ABOVE RIGHT: Straighten out the warps on the loom bars. In my instructions I will call the two sheds – HEDDLE SHED and STICK SHED. As you have wound your warp in pairs, the warp at this moment looks much wider than your woven band will be. ABOVE LEFT: I have opened the heddle shed and have my hand in the shed. ABOVE RIGHT: I am going to pick and keep one of the beige warps from the first pair of border warps. The warp on the index finger of my right hand will be kept. The one lying across the fingers of my left hand will be discarded. I do the same with the other border pair. Now I am going to pick and keep all the white warps in the pattern area and discard all the reds. ABOVE LEFT: Here I am holding the two picked beige border warps in my right hand and am working with the first pair of pattern warps. The white warp on my index finger will be kept and the red will be discarded. ABOVE RIGHT: Working my way across to the left, I have picked 6 white warps. The discarded reds can be seen below. As I pick the whites I pass them to my right hand. ABOVE LEFT: Once all the white warps have been picked along with the two beige borders, I place my beater/sword within, beat, prop open the shed and pass my weft from right to left. ABOVE RIGHT: Now I place a stick within this shed (the shed through which I just passed the weft). I HAVE NOW WOVEN THE UPPER LAYER OF MY DOUBLE WEAVE BAND. 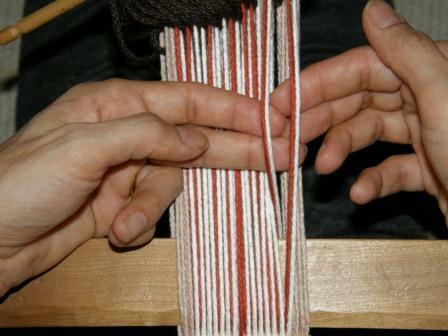 There are two steps to weaving one ”row”. First you weave the upper layer and then the lower one. I have just picked all the white warps in the pattern area to weave the upper layer. Now we will weave the lower one. I need to create a NEW shed in order to do this. ABOVE LEFT: I have just passed the weft and placed a stick within the shed. ABOVE RIGHT: Now I open the stick shed, place my beater within and draw it down toward the weaving line. Holding the stick and the beater together in both hands I lift them up. ABOVE LEFT: I have the stick and beater grasped in my left hand. I am tilting the warp so you can see the NEW shed that has been created. You can clearly see the red warps and the borders that will form the lower layer of this double weave. Place your hand within this new shed. ABOVE RIGHT: Now I can remove the stick and beater and place the beater within the NEW shed. Beat. ABOVE LEFT: Prop the shed open with the beater and pass the weft from left to right. ABOVE RIGHT: Open the stick shed, place the beater within and beat. You have now completed the first ”row” having woven a white layer with beige borders for the upper surface of the weave and a red layer with beige borders for the lower surface. You can now weave the next row. Once again you will pick one beige warp from each pair of beige border warps and then proceed picking all the white warps and discarding their red partners but this time you will be working in the stick shed.. ALWAYS TRY TO ALIGN THE TWO COLORS IN YOUR PATTERN AREA PAIRS OF WARPS IN A CONSISTENT ORDER. IN THE SAMPLE BAND ABOVE, I HAVE TRIED TO ALWAYS KEEP THE WHITE WARP ON THE RIGHT OF ITS RED PARTNER. SO, I PICK THE WHITE AND THEN DROP THE RED, PICK THE NEXT WHITE AND THEN DROP THE RED. MAINTAIN THE ORDER WHITE, RED, WHITE, RED ETC…….. If you don’t do this you will end up with your warps spiralling around each other. Keep an eye on what is going on with your warps up beyond the shed stick. Some spiralling will occur but it shouldn’t be excessive. Keep weaving background and get accustomed to the sequence of moves. ABOVE LEFT: Here is the first triangle motif on its chart. In the first row, the warps have been numbered counting from right to left. First there are three background color warps, then nine motif color warps followed by another three background color warps. ABOVE RIGHT: This is how it looks woven. First you need to see in which shed you need to begin the pattern – the heddle shed or the stick shed. On the pattern chart you will see a heavy black zig zag line on the left and right of the motifs. The zig zag line points to the RIGHT in the FIRST row and then points to the LEFT in the second row (labeled on the above chart). This means that you need to begin in the shed which has the first pair of red and white warps on the right. Look at the picture above. Here I have the shed stick shed open and the first pair of red and white warps is ON THE EXTREME RIGHT. I am holding this pair in my right hand. The first pair of red and white warps in the heddle shed, which I am holding in my left hand, is on the left of this pair. So I need to start my pattern in the stick shed. ABOVE LEFT: First, I pick one warp from each pair of border warps. Then I pick the first three white background warps according to the motif chart. The red partners are dropped. The picked whites are passed to my right hand. ABOVE RIGHT: Now I have to pick 9 red warps. I am going to first drop the white warp in this pair and then pass the red warp to my right hand. At left, I have picked all 9 red warps and passed them to my right hand. I always first drop the white and then pass the red. Now I just need to pick the 3 remaining white warps for the background. First pass a white warp to the right hand and then drop its red partner. The picture below left shows the completed picked shed. -reopen the opposite shed, place the sword within and beat. Now you are ready to weave the second row. The second row comprises (reading right to left)…………..3 background warps, 8 pattern warps, 4 background warps. Above right, you can see what your triangle motif will look like on the back of the band. nks to more pattern cahrts for this technique can be found here on my blog. Here are two videos showing me using this technique to weave a Mexican motif mug rug. The weaving method is exactly the same as that described above except that I am inserting the sticks in a slighty different way and order which I find a bit more efficient particularly on wider warps. In the example above, I am using 60/2 silk…way too fine to be picking up threads by hand. Using extra heddles means that I can raise the dark and light sheds and place swords within those sheds to form a cross. Then I can just scoop up groups of colors with a pick-up stick. This also prevents having to watch out for the spiraling that happens when you use only two sheds. In this piece there were LOTS of ends of 20/2 cotton and so using four sets of heddles made sense here. If I am weaving narrow bands I keep things simple and just stick with my two sheds. WHAT ABOUT THE INKLE LOOM? 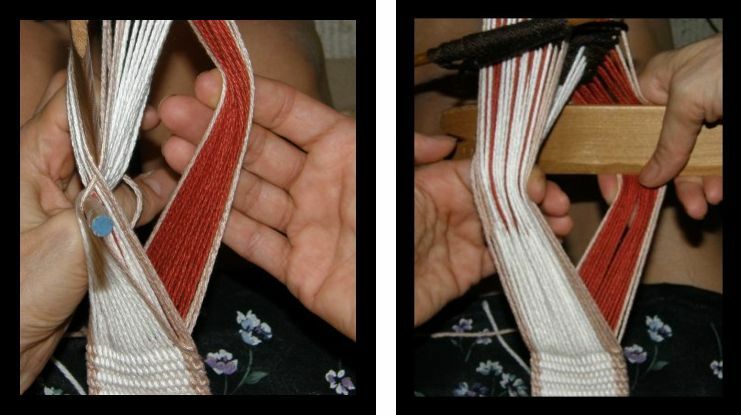 Here are some pictures showing what double weave looks like on the inkle loom. I will call the inkle loom sheds the Heddle Shed and the Open Shed to differentiate between the two. 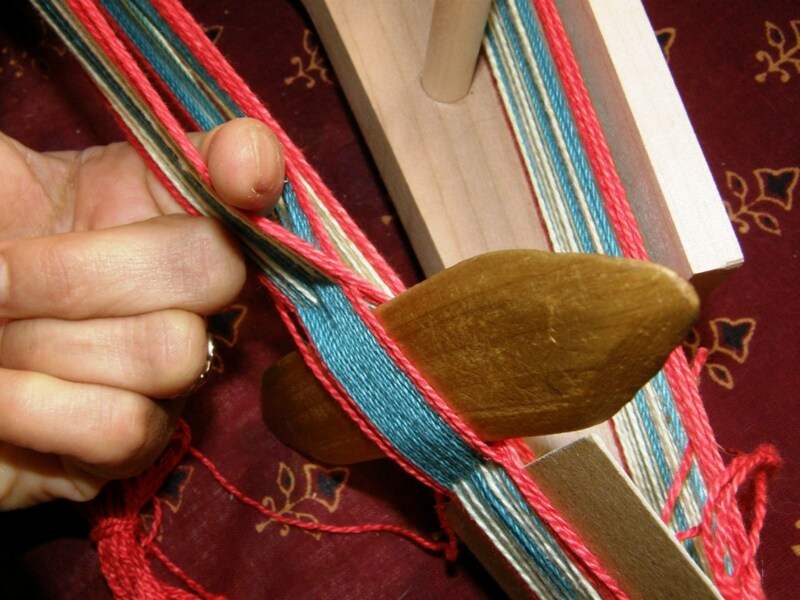 Here are the doubled threads as they pass over the peg on my inkle loom. Here is a close up of the doubled threads through the heddles on my inkle loom. One row of background color has been picked from the heddle shed for the upper layer. This is the width you are aiming for – all the warps pushed together to hide the weft and form a warp faced surface. 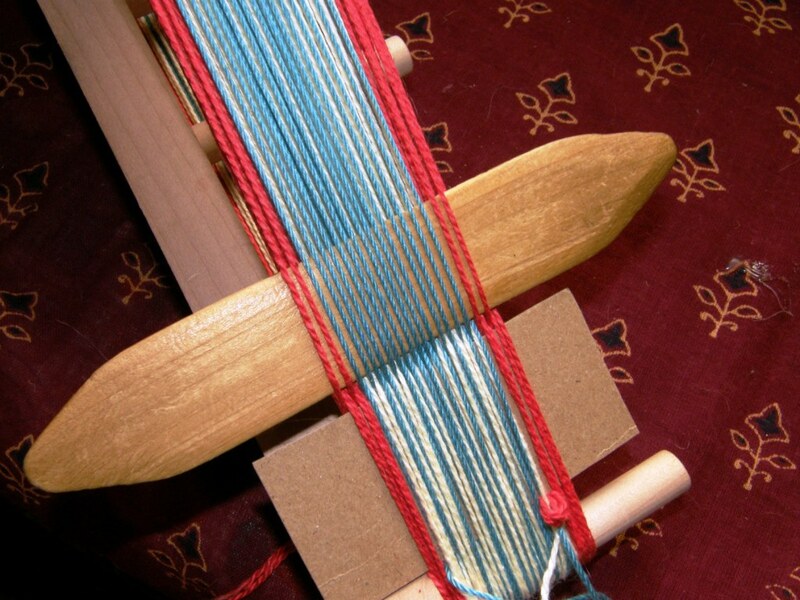 It will take 3 or 4 weft passes to catch in all the border warps and have your band looking warp faced. The first few weft passes will feel quite awkward. I have passed my weft through the first shed of picked background color warps and left the beater within that shed. I have opened the open shed and have placed my forefinger within. I am tipping the inkle loom on its side so you can see what is happening. You can just see the yellow warps that form the lower layer of the double weave. Now I can slide my middle finger into the shed above all the yellow warps. I will remove the beater and place it within this shed replacing my middle finger, beat and pass the weft. Open the open shed, place the beater within and beat. Now you are back to the beginning except that this time you will pick all the blue warps in the open shed. Here is what a small simple motif will look like. I think the WeaveZine article will help you to get started. It has videos! I will email you. Hola !! Espero que entiendas español. Hoy me encontré con tu sitio y llevo toda la tarde en él muy felíz aunque usando el traductor de google porque mi inglés es muuuuy malo. 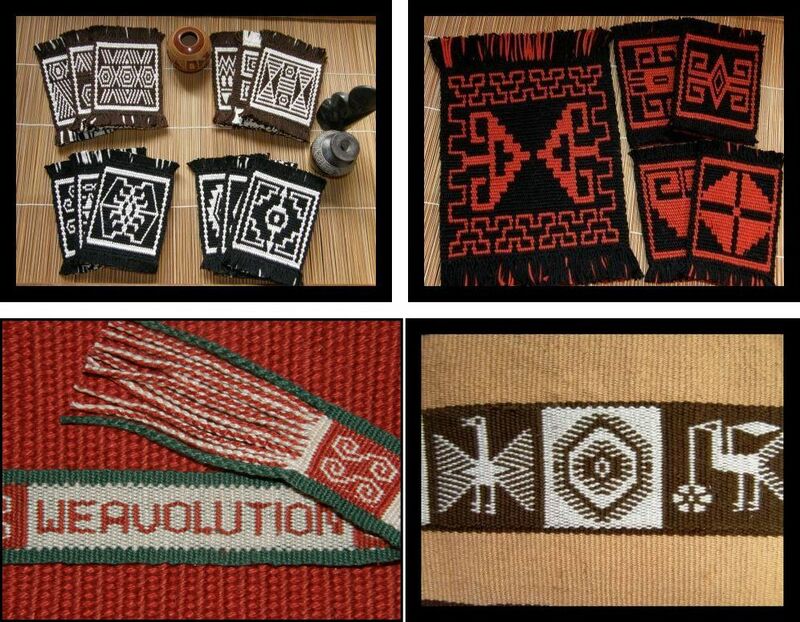 Te cuento que hace un tiempo incursioné en el telar de tarjetas (tablet weaving) y en el telar vertical mapuche, pero todo sin mucho éxito porque no hay buenas páginas con tutoriales para guiarme. Ahora que he hallado la tuya intentaré seguirlos. Estoy enferma y el tejido es mi terapia. Te agradeceré que me sugieras algúna pagina en español o material al que pueda acceder. Tal vez no lo sepas, pero encontrar tu sitio hoy fué un enorme gesto de amor para mi. Muchas gracias. Is this about the same as the Pebble weave? I have tried this with just the printed pages and totally messed it up; the book does mention that Pebble weave makes the two sided also. No, double weave and pebble weave are different. Pebble weave is double-faced so you get the same design on both sides on the “pebbly” background. Double weave has two layers which are joined by an interchange of warps. Each layer has its design and the colors are reversed on the two. That is why it is so thick. In double weave you get a smooth solid color background to the designs rather than a pebbly one. I suggest trying the warp substitution tutorial first. You will weave a design on a solid color background but only on one face. The upper face of the band will look very much like what you can achieve in double weave. The back of the piece, however, will have long floats. This warp substitution technique will give you a chance to practice handling the pairs of warps and the pick up without having to worry about the two layers. When you have learned this skill you can use it then to try the double weave. My problem is fixing in my head the shed changes for the double weave- 1st (heddles)pattern shed is picking the pattern threads, second shed (stick) is lifting the opposite shed and together with the first picked shed- open the third shed (x); the fourth shed is passing the weft thru the second (stick) pick- next row is opening the opposite shed from the 1st-(heddle shed); ie: stick shed- and picking-up the threads of the next row of the pattern.?? 1. Open heddle shed, pick pattern following first row on chart and pass weft, (say right to left). Laverne, Yes, that does amke sense; You should have seen me with the short warping– nothing like when I warp for the four harness floor loom- it took some time to remember to just make one cross!! The sheds make sense to me now- no idea why something so simple just will not stay in my brain!! I do so want to make the Llama key fobs- in my llamas colors- that is my goal!!! I should send a photo of him; as soon as I figure out how to do that!? Thank you so much!! I am going to print this out and take it to my loom!!! Just going to continue where I left off- even if the previous is ssoooo wrong. I am a disabled Army vet and widowed no so long ago- my children and grands are too many states away; so this lom project will keep me very busy thru the holidays. Great! At first it all just seems like a bunch of confusing steps but then once it starts to make sense it looks more like a logical process and therefore easier to remember. Please do send me photos of your llamas and your work. I am away from family and don’t really do Christmas so I will be busy at my loom too! I am presently working on Pebble Weave but double weave is not far away! I especially appreciate the photos as with my dial up I can’t view videos. p.s. The print version of Pebble Weave is gorgeous and very easy to learn from. Okay, I have my teeth into the instant pouch idea using this technique, but I’m also slow and not great at extrapolating, so I might make a pest of myself in the next few days. And I’ve been trying to decide what the most appropriate place for my questions is, so I hope this is a good one. First question being, since we’ve covered that you can put the warps in extra heddles when not doing pick up, is that sufficient to create the “extra” sheds that form the different layers, or do you still need the stick and the pulling? Also, when you added the supplementary weft design on your pouch, how did that work? You said you used the guatemalan technique, but how does that work on double weave? I’m pretty thoroughly hooked on backstrap weaving at this point, but I’m very cautious still, and I’m so very glad that you’re out there being adventurous so that I don’t have to be, at least not yet. Having the extra heddles just means you don’t have to pick every thread by hand from the shed but you still have to create the new shed to weave the lower layer using the stick etc as I show in my instructions. The supplementary weft patterning is just worked on the upper layer as if you are weaving a single piece of cloth. 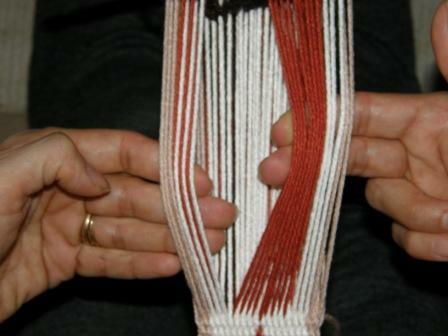 The layers are separated as you are weaving a tube and so you are working on two separate pieces of weaving. I did the weft inlay on the purple layer and not on the yellow. Okay good! I’m pretty sure that means I understand how the layers are woven, since that’s what I would have expected. I’ll be taking things slow for a while, but I have ambitions for a bag with a pattern I charted. I’ll practice that on samplers for a while, while I make plain bags with the double weave. I’m super excited for this, and trying not to fool myself into thinking that I won’t make mistakes….hubris is a little bit of a thing inside my head. I think I’m ready to try this though. If I can, I’ll get a picture to show you! Hey Laverne, I purchased your Andean pebble book and have been practicing, but no matter how much I try to be careful, every time I change to a new shed, I have to keep on fixing the warps because they keep going over each other, I did what you said about being consistent with picking up one certain warp first every time before dropping the other, but I still need to fix the warps after each shed change, please help. You don’t have to keep fixing the warps every time you change sheds. As long as you wound your cross well when you first made the warp and are picking the warps in the correct order, then you just have to trust that all is well. Sometimes the warps may look like they are out of order when you open the shed but that is because you are weaving a warp-faced textile and the warps are all pushed close together. They will be in the right order and you need not even look at them. Just beat and pass your weft, open the next shed and beat and you will see that everything is just fine. I arranged the warps to always look in the right order for the photos in the book for teaching purposes but in reality they don’t always sit beautifully like that but they ARE in fact okay…you don’t need to touch anything. Thank you so much for your quick reply, I trusted it as you said and it in fact was ok. I guess I just panicked because it didn´t look like a photo lol. Wow! I think I’m hooked… I spent nearly an hour beating my head against a wall trying to get the lower layer to work, then for some reason the right border had long floats appearing. And THEN I noticed the Inkle loom section (fool! always read to the end before getting excited). I have finished the first 3 triangles and 1 diamond, and am really having fun now. I’ve ended up with a ruler (beater/shed stick), pencil (stick) and fat double-pointed knitting needle (finger stand-in to make picking the bottom layer out easier) as my tools. I must confess, I’ve disregarded the advice – this is only my 3rd inkle – but I do have a lot of rigid-heddle and a tiny bit of cardweaving under my belt, so how hard could it be? (er, very, if you don’t read the instructions properly…) Anyway, thanks so much for a really clear, inspiring tutorial! You are very welcome. So glad it all came together for you in the end! Is there a trick for recognizing which layer you’re on? Every time I set my sampler down, I lose track of which shed I opened last. You could pay attention to the way the threads are staggered and note that when you are in a certain shed they are staggered to the right and then read from there which shed comes next. Otherwise, use the sequence of steps that I show in the video (which is slightly different to that shown in the step-by-step pictures) and leave your sword in the shed when you have to put your work down so that it is in place and ready to weave the next row of pick-up in the upper layer. I have a very general question….is there a method of weaving where either the warp or weft is largely or completely hidden? I am thinking that there are some techniques where this is nearly achieved, but wanted to see if you knew about this? Most of the weaving I show here on the blog is what is called “warp-faced” which means that the weft is completely hidden across the fabric and only seen at the edge where it turns. 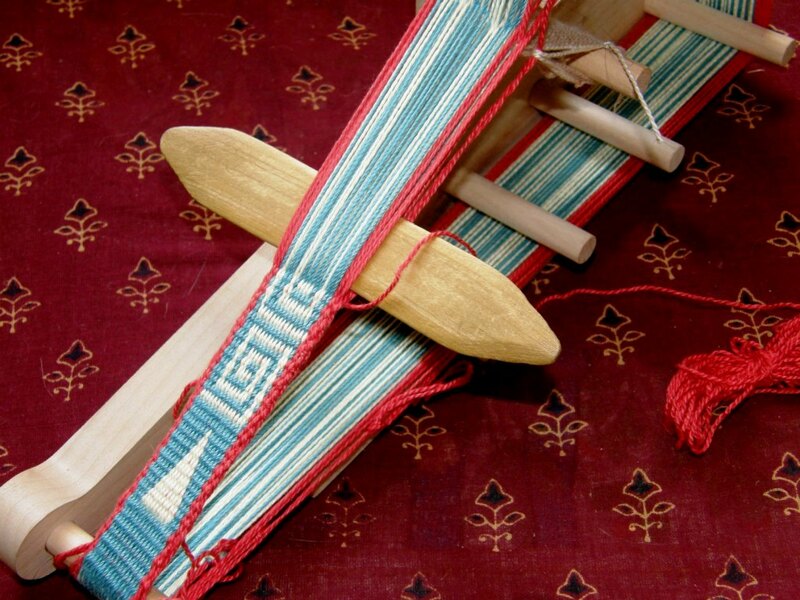 Tapestry weaving is an example of a structure in which the warp is completely hidden. Yes! Thank-you. Just what the Dr. ordered! excellent super excellent explanation pictures and steps for double weave, this is the first time a find such a good blog about double weave. I never tried double weave but love the look of it. Greetings from Argentina, country that masters the Pampa double weave. Thank you for sharing! Bellísimo trabajo. Maravillosas manos que diseñan con amor. Felicitaciones y gracias. Hello again! I’m all over your site this week! I have a few questions that have come to me after reading this a few times, and working on my rigid heddle loom with some double weave there. 1) Where do you go over making pouches using this? Did I miss it, or has it moved? 2) Can I put in a set of string heddles on the lower layer sheds that I’d pull down to create the sheds? This is how I use the RH and a pick up stick for my RH loom. And 3) How do you think chenille would stand this kind of abuse? I’d love a way to weave a double weave shawl using my chenille without buying a 4-shaft loom. Thanks again! I can’t leave your site!! 1.) I don’t have a tutorial on making pouches in double weave. I made a seamless glasses case in double weave and showed it in a post but I don’t go into all the details of how it was made. 2.) Yes, you can. I used a loom that way once. 3.) I have never worked with chenille on any loom so I couldn’t tell you. Thanks so much! I’m sure I’ll have many more questions on many things from your site. You’re like a wonderful library with great tutorials and ideas! Hello. Thank you for this tutorial. I love this technique – it’s really clever. I’ve been using it on my floor inkle loom and have resolved a problem I had with the lower layer. I didn’t always notice when a warp thread stuck, which resulted in the weft thread showing – it’s not too easy to undo especially if it’s a few rows back! I’ve started using a small hand mirror to check the underside when I create the shed so I notice any problems immediately. This works and saves me from getting a crick in the neck! I just thought this may help anyone with the same problem. He seguido su página desde hace un buen tiempo, ha sido un gusto, pese a que tengo un inglés muy básico, gracias por los aportes que Usted hace a todas las personas a quién estamos interesadas en el arte del tejido. Ahora estoy en Buenos Aires y estoy aprendiendo el tejido Pampa, es un tejido de doble faz y supongo que es similar al que Ud hace referencia en este artículo. Gracias por todos los conocimientos que nos transmite. Hello Laverne, after studying your fabulous explantion of one weft double weave, I could learn to weave motifs and letters! Thanks a lot! I would like to send you a picture of my work, but I don’t know how to do that. What is the difference between this and finnweave? I know you need 4 shafts for finnweave and it’s not warp-faced, but I know you can do finnweave with a backstrap loom if you have the patience. So what is the main difference between the two techniques? Thanks! The MAIN difference is, as you say, that this is warp-faced and finnweave is not. With a balanced double weave like finnweave you carry two colors of weft for both the upper and lower layers because the weft is exposed. With warp faced double weave you don’t see the weft and can just carry one for the upper and lower layers. So, the pick-up in finnweave involves exposing the weft in just the right places in order to create a motif. In warp-faced double weave you are simply choosing one color warp thread over another to form the motif. I do both on a backstrap loom. If you have a reed to help maintain sett, finnweave on a backstrap loom is easy with multiple sets of string heddles. I haven’t yet used a reed for finnweave as I found the sett fairly easy to maintain. Awesome, thanks for the thorough answer!! Beautiful work! I was wondering if you have a chart for the birds (the ones in the examples section above the llamas?) Thanks! Thank you. I post a lot of charts here on my blog but don’t give them all away. Double weave is by far the easiest of all the structures I weave to chart. Once you are weaving double weave confidently and understanding how it works I am sure that you will easily be able to chart those birds just by looking closely at the photo. I tried your new Inkle project using your embedded double weave method, and it works great.